The Cavendish Hotel has been a family favourite of ours for many many years and its standards have never dropped. It’s always something to look forward to when we go to The Cavendish and our most recent trip was no exception. There has been an Inn of some form on the spot for centuries and it became part of the Duke & Duchess of Devonshire’s estate around 1830 and renamed The Cavendish in 1975. 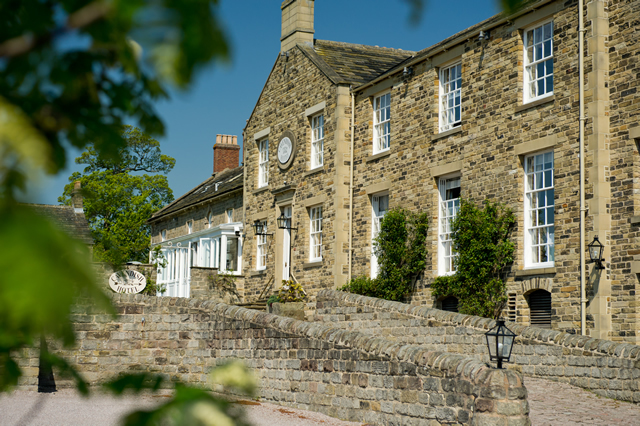 Set within the Chatsworth estate, the views of the Derbyshire countryside are beautiful and so peaceful, creating a superb location for anyone looking for a relaxing meal or a luxurious weekend away. The Cavendish is a restaurant as well as a hotel and it is open to non-residents. The main dining room, The Gallery, tends to be very busy, so a reservation is advisable. There is however also the Garden Room – a conservatory style dining area, which offers gorgeous views as well as a menu of seasonal dishes. 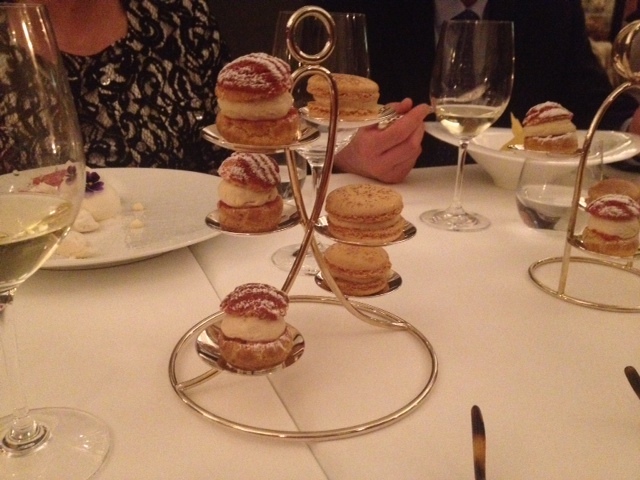 We tend to eat in The Gallery as it is usually an occasion when we visit the hotel. 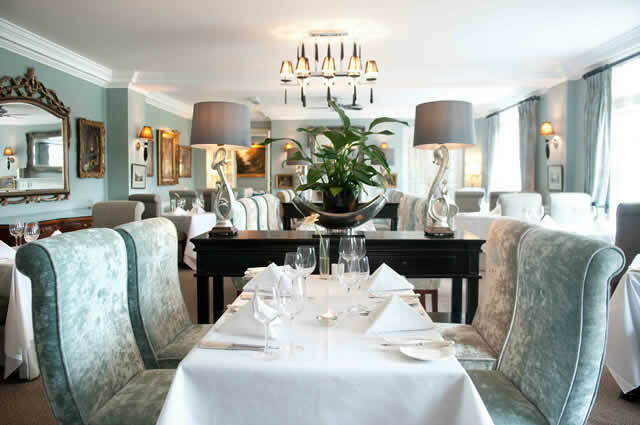 It’s a wonderful room, not too big or small and offers a top quality setting, to enjoy some of the finest food I have eaten in any restaurant, highlighted by its consistent accolade of two AA Rosettes for food every year since 2005. As with many other top restaurants, there is also the option of eating at a table in the kitchen, as head chef Mike Thompson and his team prepare food for the restaurants. The menus are created using fresh ingredients, many locally sourced, to create imaginative, delicious food that rivals the best London restaurants. Our recent meal was no exception. 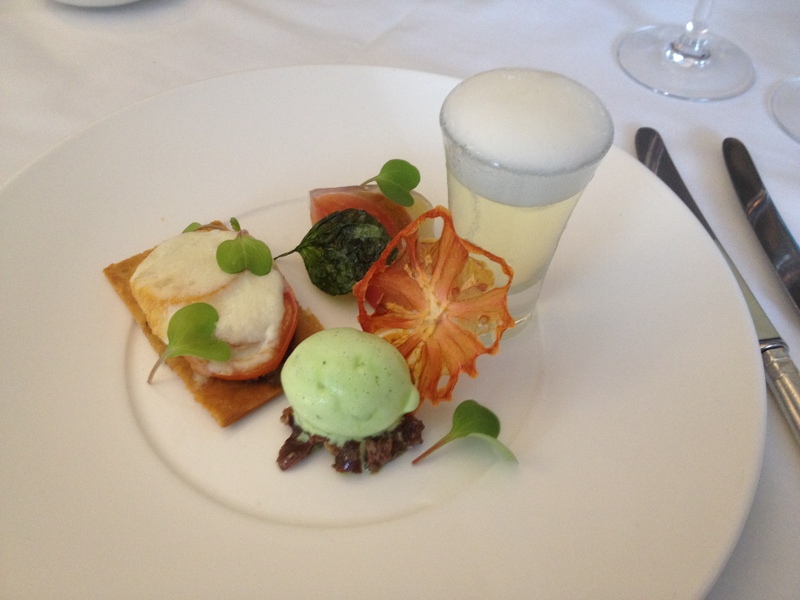 I enjoyed a starter called Heritage Tomatoes, which was a light, delicious and beautifully presented dish including a clear tomato gazpachio, tapenade and mozzarella tart and basil ice cream! My main course of cornfed chicken with chicken mousse, garlic fondant potato and roasted salsify was just as wonderful. 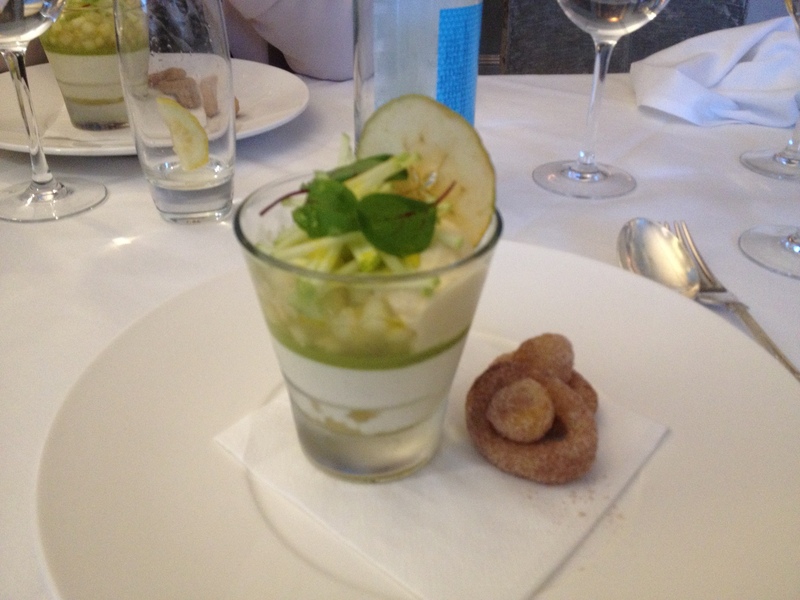 I then chose the Apple Trifle with Horlicks mousse and cinnamon doughnuts for dessert – a twist on a traditional classic, the combination of apple, cinnamon and surprisingly, horlicks was gorgeous, without being too heavy to end the meal. 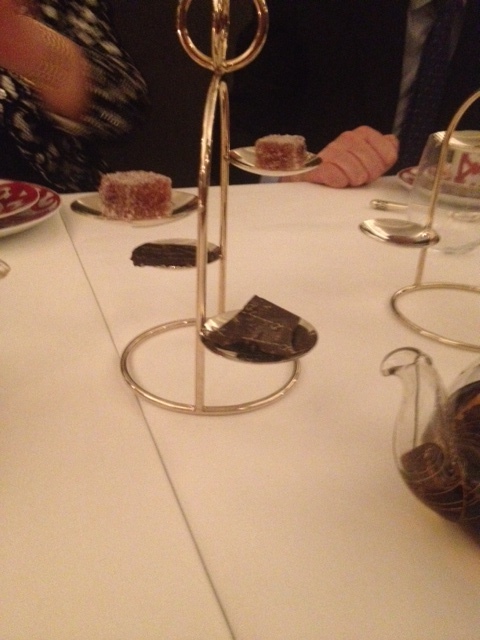 It is also the little extra touches at The Cavendish that stand out, for example, its petit fours with tea and coffee are always a delight. I do still miss the canapés that used to be served as you relaxed in the lounge area before dinner and noticed that there were no specials in addition to the menu this time, but these are minor points when the food is this good. Crucially too, as its food is of a standard found in many highly rated London restaurants, The Cavendish really is very good value for money, costing around £45 a head for three courses. As well as offering an exceptional dining experience, it is also a wonderful location to simply spend a relaxing weekend, for people of any age. 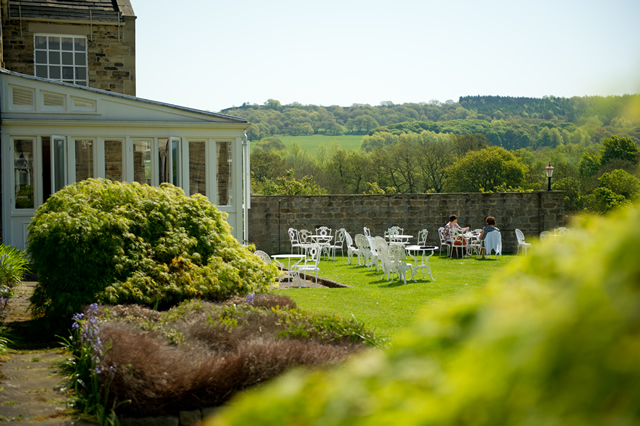 The rooms have all been recently refurbished and continue to offer a superb setting, perfect for any occasion, whether you wish to explore the surrounding Peak District, visit Chatsworth House or simply relax within the hotel’s sitting room or outside in good weather. 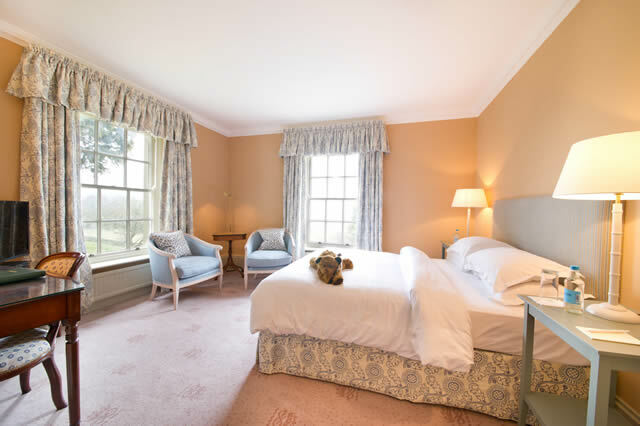 For those staying at the hotel, I will however warn you that the gorgeous teddy bear in your room (see him on the bed below? ), which you can purchase from reception to take home, is something that may tempt you during your stay (especially if you are staying with children or the young at heart)! Lovely accommodation (plus teddy bear)! The other key to The Cavendish is its staff. Some have been at the hotel for many years, while others continue to join the team. They are all always professional, while being incredibly welcoming, friendly and helpful. This is not always the case in hotels and restaurants and they are a special part of The Cavendish and it’s always lovely to see long-serving staff each time we visit. 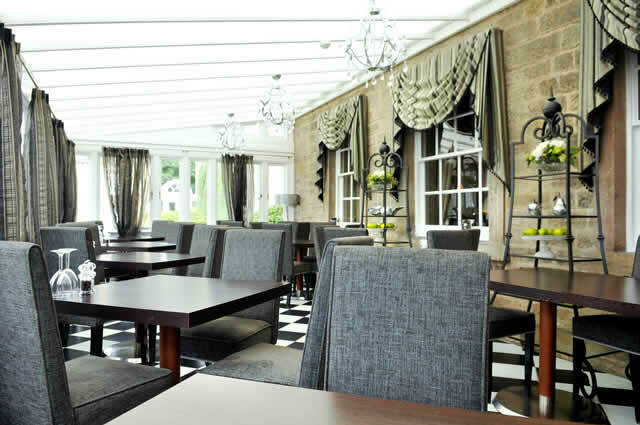 Whether you live in Derbyshire or the surrounding area, or are simply looking for a relaxing weekend away and want to feel well looked after and enjoy some of the finest food, wine and surroundings you’ll find anywhere, I cannot recommend The Cavendish highly enough. It remains a gem in the north of England and I love to return there as often as I can! 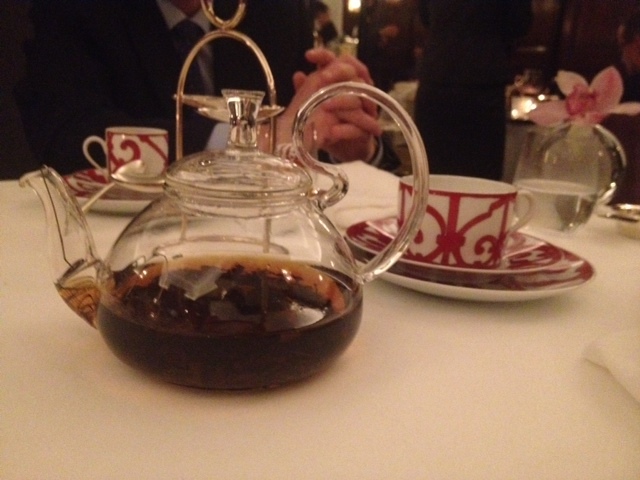 I was lucky enough to have dinner last weekend at Hélène Darroze’s two Michelin-starred restaurant at The Connaught hotel in London. Since its opening in 2008, I have heard lots of praise about this restaurant and Hélène’s ability to create incredible food from the finest ingredients of the season. This is so much more than dinner. 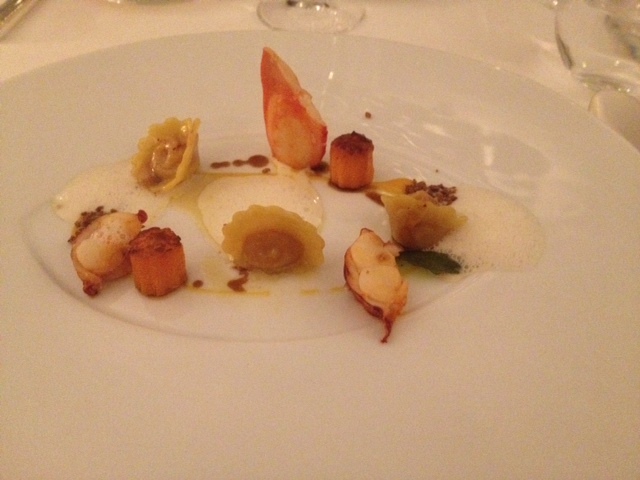 It is an exciting exploration of flavours, beautifully created by Hélène and her team. 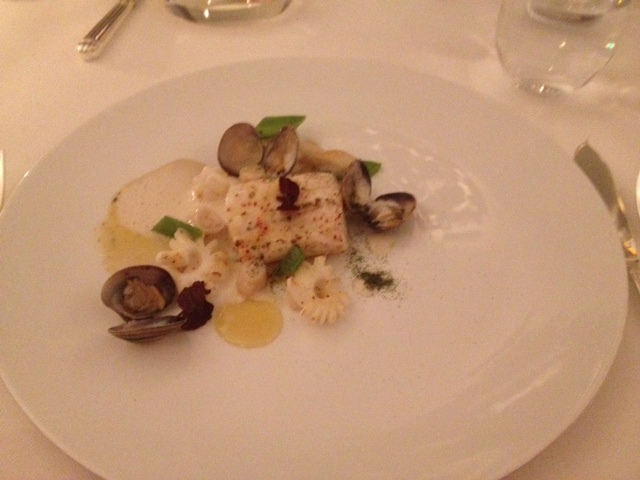 Our incredible dining experience was unique from the very start when choosing from the menu. The reason for this is that there is no menu here. Instead the waiters bring to your table slim pieces of wood on to which is listed the ingredients that Hélène will be using to create the evening’s meal (under each one is also listed a small number of other ingredients that will also make up that dish). 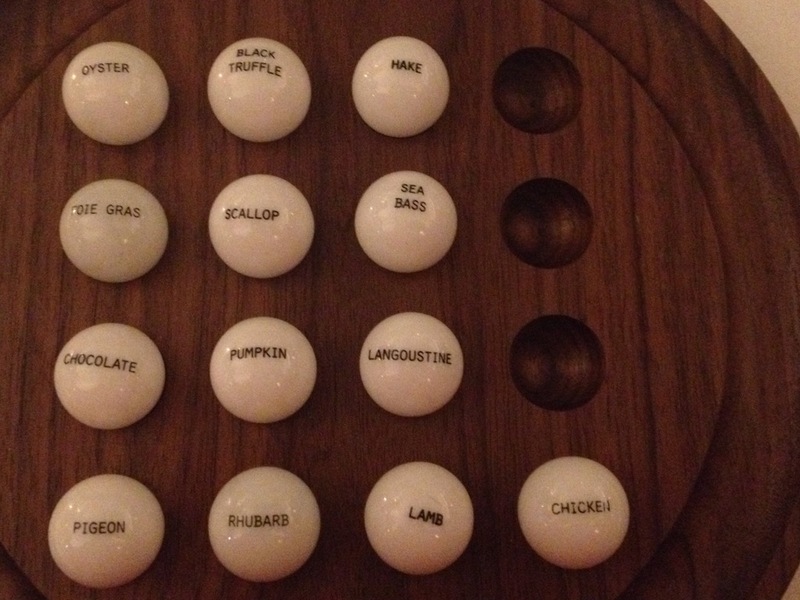 Ours were Oyster, Langoustine, Foie Gras, Pumpkin, Scallop, Seabass, Hake, Lamb, Pigeon, Chicken, Chocolate, Rhubarb and Black Truffle. 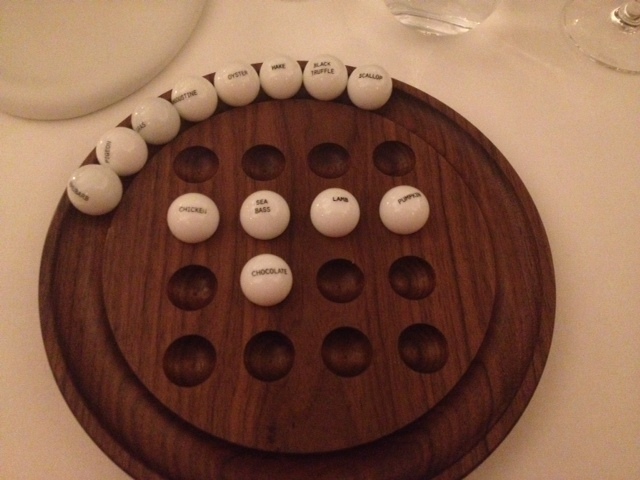 Each of us was then given a circular piece of wood containing 13 white marbles, each of which has one of the ingredients from the list printed on it. We were then told that to choose our food we simply had to remove the marbles we did not want from the inner section of the circle and leave them around the edge. The number you choose depends on the number of courses your party has chosen. The smallest (and cheapest) is 5 and the most is 11. It was lots of fun reading the ingredients list and choosing our dishes, not quite sure what the final course would be or in what order your choices would be presented! 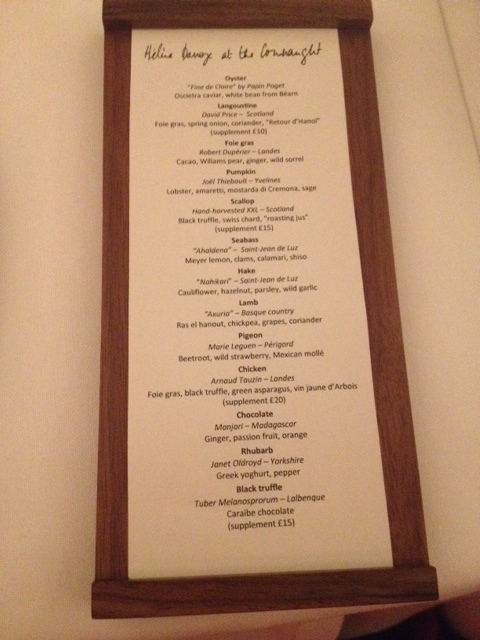 This is a unique way of choosing a meal that certainly made me think more about the flavours and combinations than simply selecting courses from a standard menu. 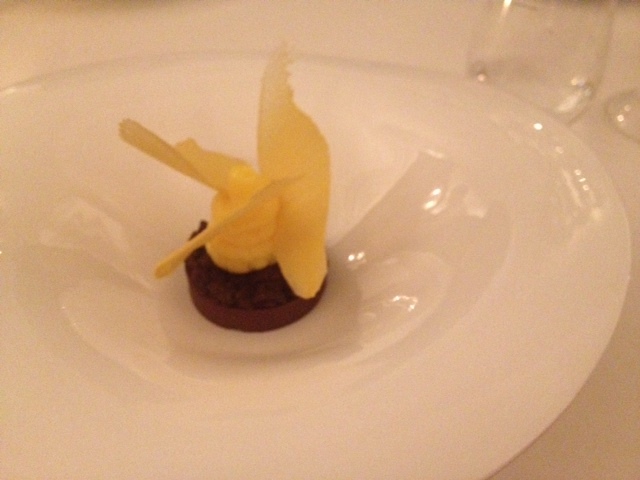 It also highlights how skilled the restaurant team are in using seasonal produce to greatest effect. The meal was quite simply superb and some of the best food I have ever eaten (although as a dining experience my once in a lifetime visit to The Fat Duck last year stills wins). 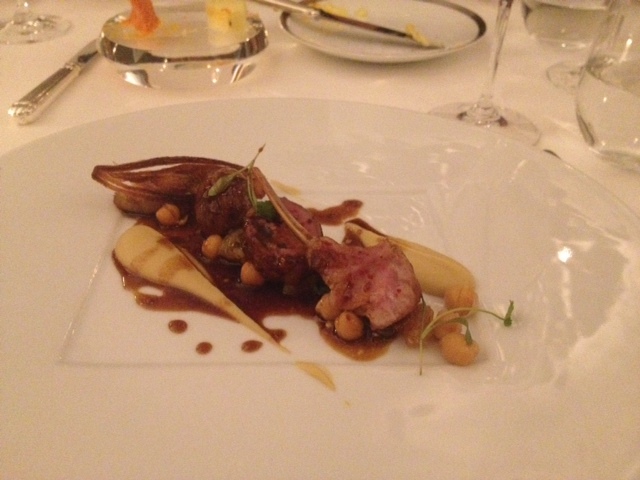 Every dish we each had was cooked to perfection and intricately presented. I tasted flavour combination I would never have even thought of – Lobster, Pumpkin and Ameretti biscuits is, for example, wonderful! 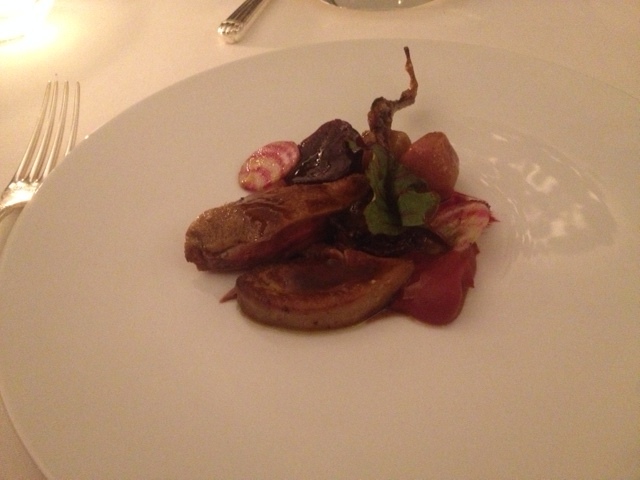 Photos of my choices (Seabass, Pumpkin, Lamb, Pigeon and Chocolate are below). 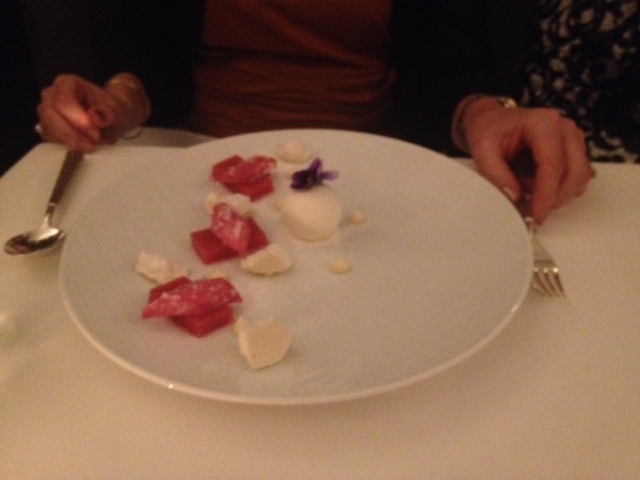 And here was the Rhubarb dessert which also looked delicious! The waiters were also excellent, being both professional and friendly, happy to answer any questions about the menu or dishes once they were presented. They seem to enjoy seeing the reactions everyone has to the food and the experience as a whole. The wines are also wonderful and the sommelier was very helpful in providing additional information about the wines. Once our five courses were over (as well as a small entree) we were feeling quite full, but there is still time for a lemon sorbet palate cleanser (although this was a bit too creamy for me) and tea and coffee is also served with petit fours that would pass as dessert in some restaurants and even after that a trolley arrived at our table offering us something sweet to finish (either some chocolate, apple crumble jelly sweets, nougat or marshmallow)! 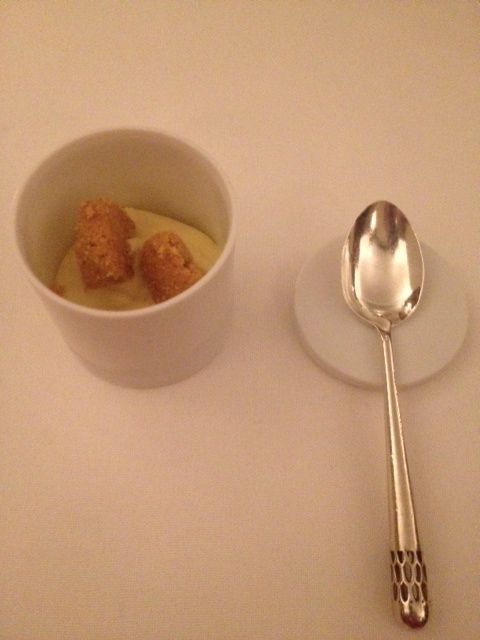 If you are in London and are able to experience this incredible food, I would urge you to do so. You certainly will not regret it! For more details the link to their website is below.